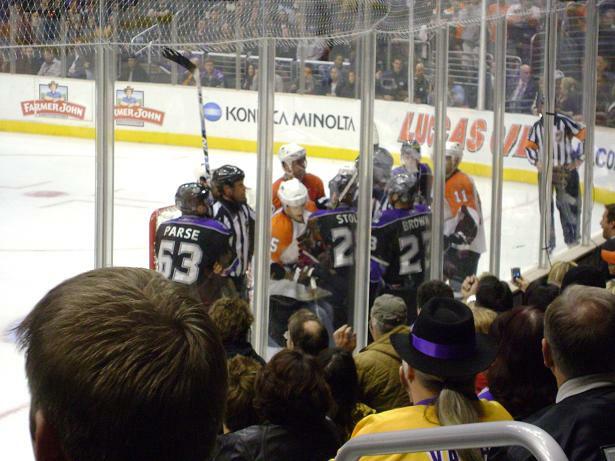 My boyfriend and I love to go to Staple Center to cheer for our favorite team, Los Angeles Kings. (It’s especially fun now because the boys are having a pretty good season!) Hockey is, hands down, the best sport in the world to watch, with great speed, intensity, and energy, but it’s unfortunate that the fun doesn’t translate well on television. I always encourage people to go watch a game live to really understand the beauty of the sport. I wasn’t even a fan either, until I went to my first game about seven years ago … and the rest is history! Before the game, if time permits, we like to make a trip to a nearby Little Tokyo to grab something to eat. Granted the food at Staple Center is fairly decent (especially the pasta place), but why pass up great Japanese eats when they are just a couple blocks away (where the glass of wine doesn’t cost $12)? Our latest pre-game outing was Honda Ya, located on the third floor of Little Tokyo Mall, a former home of Mitsuwa (aka Yaohan) Supermarket in Downtown. It’s always very depressing to walk through the mall, knowing how alive it once were back in mid-80s to the mid-90s, when Japan’s economy was well and there were lots of Japanese people living in Los Angeles. The good thing is that this izakaya, the younger brother of the original Orange County location, has been gaining some buzz, bringing in much-needed traffic to this ghost town. The interior of the restaurant reminded me a little bit of Musha in Torrance, but larger and slightly less modern. The wooden tables and paper lamps dangling from the ceiling added a sense of comfort and authenticity to the place. My boyfriend, along with several of my friends, have been here and liked it, so I was really excited to be able to check it out myself! 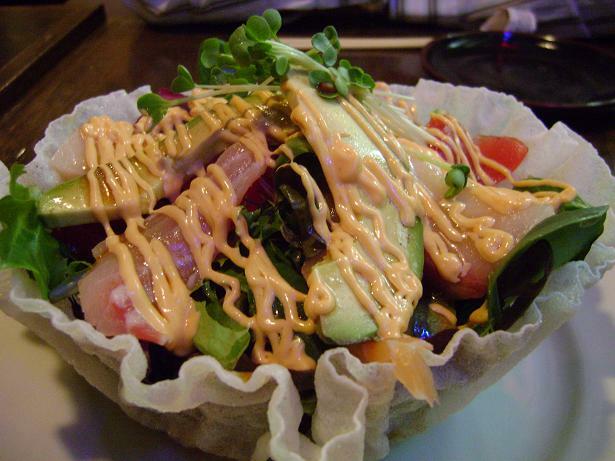 We started out by sharing the order of Sashimi Salad, mix green topped with pieces of tuna, yellowtail, and other sashimi, and avocado slices, smothered in spicy mayonnaise. There was nothing too special about the salad but I liked taking a bite out of the shell made out of deep frying a spring roll wrapper. It was so much fun to eat! 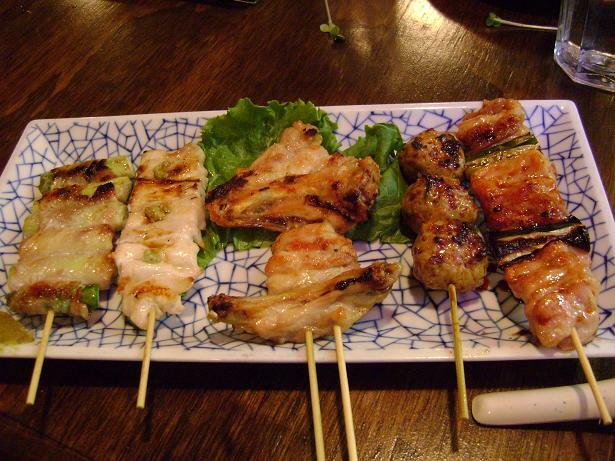 Because Honda Ya is known for its yakitori skewers, we had to try the basics: bacon-wrapped asparagus, sasami (white chicken meat), tebasaki (chicken wings), tukune (chicken meatballs brushed with sweet soy sauce) and negima (chicken and green onion). 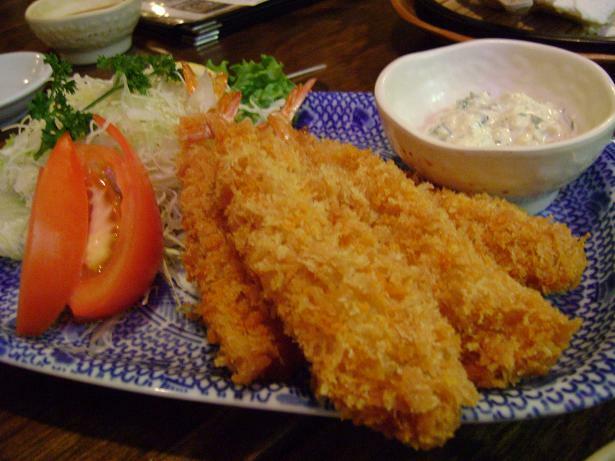 There is something so lovely about eating these yakotori with a nice glass of wine. Perhaps the popular drinks of choice at a cozy place like this are sake and ice-cold Japaense draft beer, but I like to pair my skewers with a glass of red. 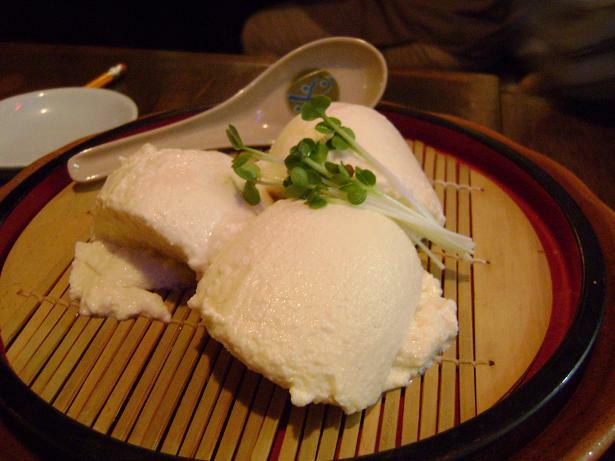 My favorite dish of the night was Hiyayakko, generous blocks of silky tofu enjoyed with aromatic yakumi (garnish) like grated ginger, green onion, katuobushi, paper-thin bonia flakes, and soy sauce. I also loved the presentation of the dish, with tofu arriving in a traditional Japanese “zaru,” usually used to serve cold soba (buckwheat noodle). 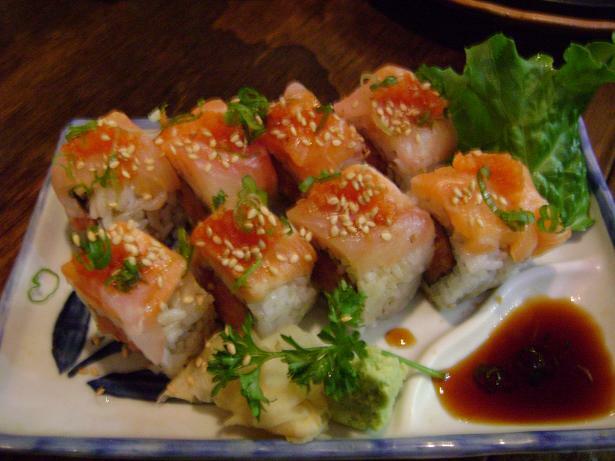 We finished the dinner with an order of Spicy Yellowtail Roll. Although none of the dishes were earth shattering, I though everything I sampled were certainly above average and even better, very affordable. I will definitely come back here to try other dishes, like boxed sabazushi (mackerel sushi roll), Au gratin potatoes, and grilled black cod, that people are raving about. I can’t wait for our next hockey game and Honda Ya outing! Every time I come here, I end up spending beaucoup dollars. Then again, it’s always with a large group, and the kitchen always gets slammed midway through a meal, which prompts massive amounts of over ordering, which prompts the huge bills at the end. Hi SinoSoul! I know exactly what you mean. I end up spending more money at places where they serve less expensive dish because I go overboard and end up ordering everything in sight! 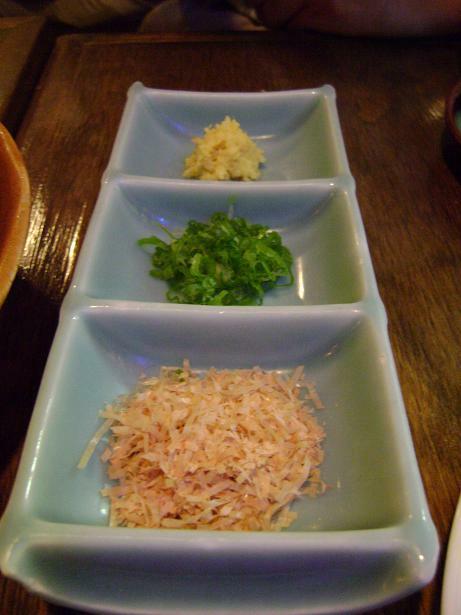 That’s why Izakayas are so dangerous! LOL. How have you been? Thanks for coming by! Your blog is always so impressive and I enjoy reading and checking out your pictures! who knew! i’ve driven by there all the time but actually never been. i’ll give it a shot next time in the area. Yeah, check it out! I think the owner there is a marathon runner. I saw newspaper articles on the wall with him running! The food is pretty good. Not as good as Musha but still very tasty!